​It’s widely asserted that spending endless hours killing in the virtual world is perhaps not the healthiest of recreational activities. Still, killing is what we want, and publishers are all too happy to fulfil the public’s lust for blood. Whether it’s sniping Nazis with antique rifles, running over zombies in seventies automobiles, or hacking dozens (nay, hundreds) of soldiers to pieces with a sharper-than-it-looks Chinese fan, the art of murder has never been far from the gaming forefront. 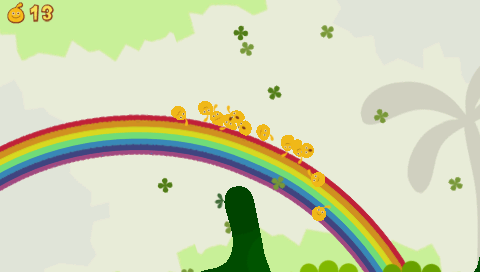 Thus explaining the appeal of LocoRoco to the bloodthirsty masses is something of a challenge. Offering precisely no guns, gore or garrotting, it instead takes place in a bright, candy-coated 2D platforming world where the sum total of your task amounts to bouncing LocoRocos (essentially a big, cute smiley blob, or a collective of smaller blobs) to the end of each level. They live on a peaceful planet, looking after nature, and singing hyperactive melodies incessantly like life is some kind of 24-hour caffeinated disco. One day however, the adorable blobs are attacked by the Moja Troop; fearsome, flying bundles of scum sporting creepy dreadlocks (or perhaps tentacles, hard to be sure). Defenceless, the LocoRocos must rescue their scholarly pals, the MuiMui, whilst liberating each area from the Moja. 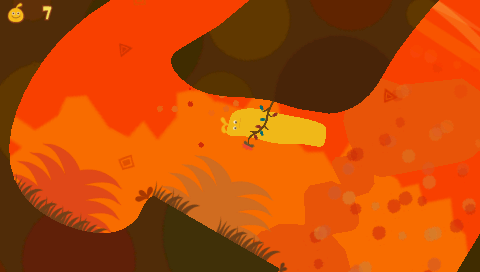 Clever controls set LocoRoco apart. Rather unusually, you assume the role of the planet, as rather than navigating the protagonists with directional input, movement is attained through tilting the environment one way or the other with the shoulder buttons; causing the blobs to roll in the desired direction, whilst pressing them simultaneously causes results in a jump (or perhaps bounce is more accurate). 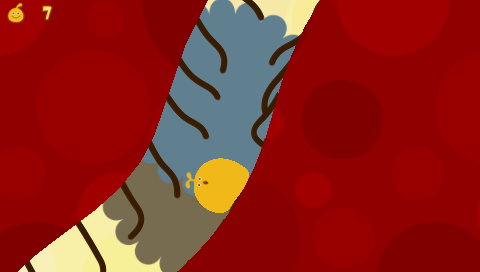 At the push of a button, you can separate the LocoRoco into several small ones, allowing you to slip through tight gaps in the scenery, while the same button causes them to reform. Consequently, it’s easy to grasp. "Toto... I have a feeling we're not in Kansas anymore"
Gaming can rarely claim to be simultaneously relaxing and engaging, but here’s proof positive that it can be done. 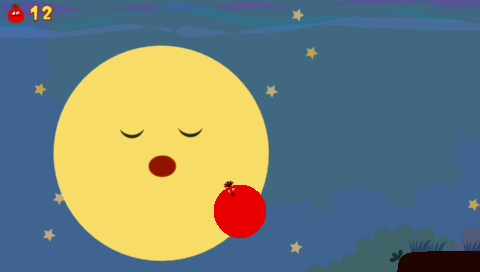 There’s a marvellous serenity to LocoRoco, a sense of never being rushed. Everything in its weird wonderland feels pleasantly balanced, and its almost-hypnotic qualities have reduced myself and many I have known to a state of dreamy, glassy-eyed serenity. A crazily infectious soundtrack deserves much of the credit for this; it’s hilarious to watch the blobs lip-syncing the songs, even when some have been unceremoniously bounced upside down. It’s all the more impressive considering that designer Tsutomu Kouno penned the lyrics in a fictitious language, derived from Japanese, so the unusual style can baffle all in equal measure. As well as some fabulously upbeat and alliterative J-Pop numbers, Kouno flirts with a host of other musical styles, and in doing so ensures that every LocoRoco has their own distinct style. The child-like Yellow is followed by Pink, whose whispery, French-inflected female tones lend themselves to more soulful fare. Blue, Green and the rest that follow flit between jazz, latin and calypso. These stylistic changes help aid the gentle evolution of the gameplay, whilst the variance in the songs and voices (they alert you if a Moja is nearby for example) means its fun to switch between them, even if you’ve a particular favourite. Many of the game’s most pleasing moments are centred around smart level design, which plays to the games aesthetic qualities. Just as the early Sonic the Hedgehog titles were devised in such a way that would accentuate its lightning-fast speed, LocoRoco raises smiles when the jelly-like creatures are used to showcase its myriad effects. These include being chewed up by owls and spat out in a different shape, being split into fifteen and sent hurtling through the sky via a vacuum, or indeed when a bunch of them follow each other one-by-one through the cogs of turning gears or bobbing through water. Along the way, you’ll have to navigate the occasional, familiar platforming trope such as blob-shrinking spikes, and likewise those evil Mojas who are only too willing to swoop in and take a bite out of you. Moving platforms, air fountains, spring pads and various other devices require mastery of the tilt controls, as well as the odd change of surface which results in some unusual physics. Wintry levels offer little traction and hurtle you around at high-speed, whilst soft ground is slower to move and causes them to sink. There’s even the occasional puzzle, such as splitting the LocoRocos so as to activate three switches simultaneously. A few more teasers like this would have been welcome, though there’s plenty of platforming to keep you happy. LocoRoco proffers a little something for novices and seasoned gamers alike. Newcomers are just as likely to finish the game, bopping through the levels and seeing all the clever bits doesn’t make for any less enjoyable an experience. For those looking for more than surface detail, there’s plenty of secrets within each level. Once you’ve an eye for it, you’ll start spotting misshapen walls or odd-looking roofs that often harbour secret areas. Alongside its other qualities, it’s also one of the most beautiful games ever to grace the PSP. Its utopian world is a total aesthetic success, and striking for its clean, primary school palette. The levels are wonderfully vivacious, using bright hues to gorgeous effect. It’s beautifully refined, sporting some eye-poppingly vibrant menus, whilst in-game LocoRoco impresses endlessly with its flawless definition and characters that sit perfectly with their environments. Perhaps over the distance, its simplicity starts to work against it a little as maintaining a tangible sense of variety becomes difficult. That said, forty levels is more than enough to be getting on with, whilst the LocoRoco House sees you amply rewarded for progression through the story, via a swathe of new music and building blocks, lending it the feel of a mini level editor. LocoRoco is not only a victory for originality and oddness; it’s a great success from a design perspective, and an ideal fit for its portable setting. A quirky, charming ray of sunshine, it’s lived longer in the memory than so many of the big action games it once so incongruously shared the shelves with. Go on, wash the blood from your hands and give it a go.